Lake Louise has a reputation for having some of the best hiking in the Canadian Rockies. This is due not only to the stunning alpine scenery but by the fact you can have a nice fresh cup of tea and a slice of cake served in an historic tea house at the top of your trek! 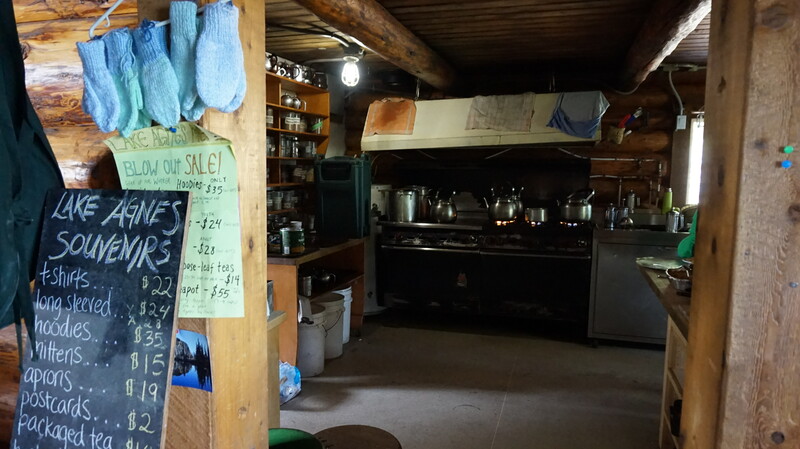 The Agnes Teahouse is only open for the summer, so it is worth checking when it opens. This year it opened in early June but timing largely depends on the seasonal snow pack melt. If undertaking this hike on a warm summer weekend it’s best to get to the Lake Louise car park reasonably early, as it fills up quickly. Alternatively, if you don’t get a spot you can park along the access road but that will add some extra kilometers to your hike! It’s also worth checking the weather – our top tip is to plan to go on a clear sky day as the views of the Rockies and Bow Valley are nothing short of breathtaking. No point putting all that effort in to see what clouds look like close up! The basic Lake Agnes hike is 10km round, with an elevation gain of 700m. The uphill is not strenuous but it is continuous for the 5km climb. First glimpse of Lake Louise – while the lake looks great from shore level its amazing turquoise colors really stand out as you gain altitude. View of the Bow Valley – as you gain more elevation stunning views of Bow Valley can be seen between the increasing breaks in the tree line. Mirror Lake – this is a beautiful lake that reflects the Big Beehive in its green tinged calm waters. Agnes Waterfall – as you climb up towards the Lake Agnes Teahouse, you will hear the sound of roaring water. A large waterfall soon comes into view as you climb the final Teahouse steps. The highlight of the hike is the historic tea house, which sits at the edge of Lake Agnes at an altitude of 2135m. The Teahouse, which first opened in 1905, serves over 100 varieties of loose leaf tea, soups, sandwiches and welcome treats! On a hot summer day, outside seating can be quite limited so you may have to wait a while. Also, the Teahouse only accepts cash. Little Beehive – this is a fantastic 3km round trip that provides quintessential views of the Canadian Rockies looking out over Lake Louise, Mt Victoria and the Victoria Glacier. Plain of the 6 Glaciers – although a separate hike in its own right, if you start early and have the legs for it you can add this onto your initial hike. Its worth it given you have worked for a lot of the elevation gain already! Bring cash for the Lake Agnes Teahouse. Start early to avoid crowds, be able to park and give yourself time to do the add on hikes. Pick a sunny day to guarantee amazing views. Bring your camera and plenty of space on your memory card – you will need it!